A very impressive winter storm brought widespread heavy rainfall to most of California last week. A strong and moist atmospheric river–with a corridor of enhanced moisture transport extending all the way southwest to the Hawaiian Islands–occurred in conjunction with a rapidly-deepening surface low pressure area off the far NorCal coast, bringing a prolonged period of precipitation to much of the state (and the Bay Area/Central Sacramento Valley, in particular). Near the coast, the initial band of rain was extremely intense, leading to rainfall rates well over 1 inch per hour in some spots and causing widespread urban/flash flooding in the Bay Area. These very heavy rain rates–a product of shallow atmospheric instability and exceptionally warm ocean temperatures–persisted as the front slowly moved southeastward, bringing localized flash flooding and landslides to coastal areas as far south as Los Angeles County. A strong wave developed along the cold front as it passed just south of the Bay Area, which allowed a large area of moderate to heavy rain to stall out over the Bay Area. As a result, 24-hour rain totals in the southern half of the Bay Area were exceptionally high, and in a few instances approached all-time daily rainfall records. San Jose, for example, saw its third wettest day in history (and its all-time wettest December day), and San Francisco saw its 11th wettest day in history (and its wettest since 1995). While modest regional flooding did result, rain rates were (fortunately) low enough (and watersheds dry enough) to prevent major flash flooding from occurring in most instances. Steep pressure gradients and very strong winds aloft led to locally damaging winds, as well, although powerful wind gusts did not turn out to be nearly as widespread as was initially expected with this system. In this sense, last week’s storm did “underperform” in terms of maximum wind speed at lower elevations. At higher elevations, on the other hand, maximum wind speeds were extremely impressive–including a 147 mph wind gust at Mt. Lincoln in the Sierra Nevada, 102 mph at Henninger Flats near Pasadena, CA, and 96 mph at Cooskie Mountain near Ferndale, CA. Despite the presence of very strong winds just above the surface, these powerful gusts did not mix down to sea level to the same degree as forecast, leading to a considerably less impressive wind event in most of California’s urban areas (and therefore weaker than other winter wind events in the past decade). Very strong and damaging surface winds did occur up in Oregon, however, and Portland, OR experienced its strongest wind gust (67 mph) since 1971 . In the Sierra Nevada, very strong gusts damaged buildings and brought down numerous trees in parts of the Tahoe Basin and along Highway 395. These winds generated large enough waves on Lake Tahoe itself to allow for some mile-high December surfing! Some strong convective cells also developed near and behind the primary cold front, generating at least a handful of waterspouts over the Pacific Ocean and at least one confirmed (EF-0) tornado in Los Angeles County (very impressive home video of this damaging tornado here). 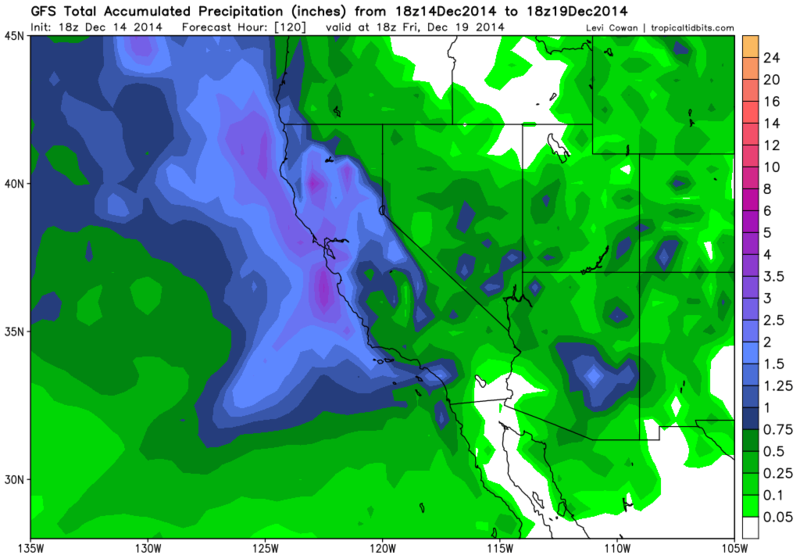 More desperately-needed rain and snow is on the way for most of California this week! A series of storm systems–all fairly substantial, but much weaker than last week’s–will bring widespread soaking (and locally heavy) rainfall to nearly the entire state this week. Given the now-saturated state of California’s soils and high levels on regional streams, some flooding could occur at various points this week when precipitation rates are highest, though no severe impacts are expected. Most of the storms this week will be colder than last week’s, and will bring more snow to lower mountain areas. Cold air aloft will also lead to increased instability, with period chances for convective activity and thunderstorms through Friday. Rainfall totals, while not out of the ordinary for a storm sequence in December, will nonetheless be fairly impressive by the standard of the last few years, with at least an inch or two for the urban parts of NorCal and likely at least double that in orographically favored areas. SoCal will see precipitation, too, though overall totals will be somewhat less than in the north. Gusty winds will also be possible, but will generally remain under last week’s levels. In the longer term, more stable and drier conditions are expected to develop toward the end of the calendar year a new ridge develops over the West Coast. It’s unclear at the moment whether this will dry period will be transient, or perhaps more prolonged (which would not be all that unusual for this time of year). Recent heavy precipitation has brought substantial short-term drought relief to most of California. In fact, much of the state is now at least marginally above average for the water year to date (Oct 1 – present). Streams are currently flowing, seasonal grasses are greening, and fire season is over–which is a lot more than could have been said last December. Some local reservoirs were able to capture quite a bit of runoff from these storms, and even the state’s big reservoirs finally showed a noticeable inflow pulse from these storms. On the other hand, relatively little of this precipitation fell as snow: even after this recent major storm sequence, statewide snow water equivalent remains at only 40% of average to date for the water year. This is largely due to California’s record-warm temperatures in 2014 and the nearly total absence of cold air outbreaks over the state so far this fall/early winter. Huge long-term precipitation deficits remain after 3-years of extreme drought conditions in California–in fact, the magnitude of the 3-year rain shortfall in many regions still exceeds average annual precipitation, and in some spots remains closer to two year’s worth of rain. While California does not necessarily need to “make back” this entire water shortfall to mitigate many of the most acute drought impacts, we still have a very long way to go before we’ll have any assurance of long-term improvement. 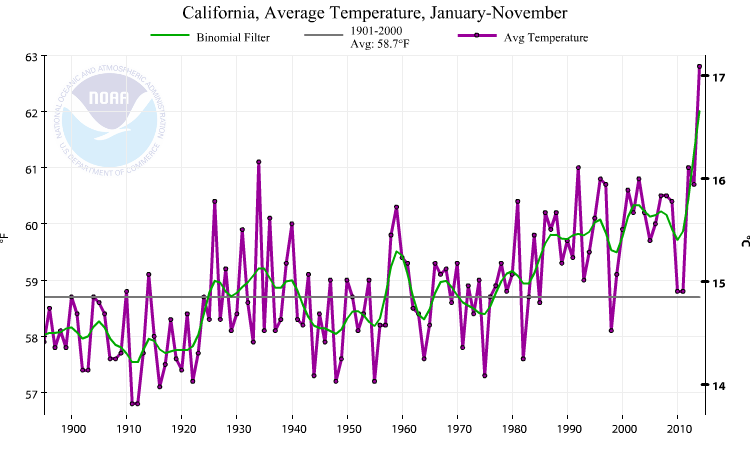 An added challenge is that 2014 is almost certain to become California’s warmest year in recorded history–and recent research suggests that these extremely high temperatures and very low precipitation have together created the most severe California drought in over a millenium. In the short term, though, it’s encouraging to finally see a more active Pacific pattern, with periodic precipitation in California. Enjoy the rain and snow this week!